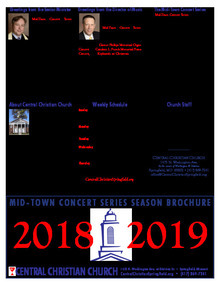 This is the new brochure for the 2018-2019 Concert Season. Inside you will find all of the concerts that will be hosted for the entire season. 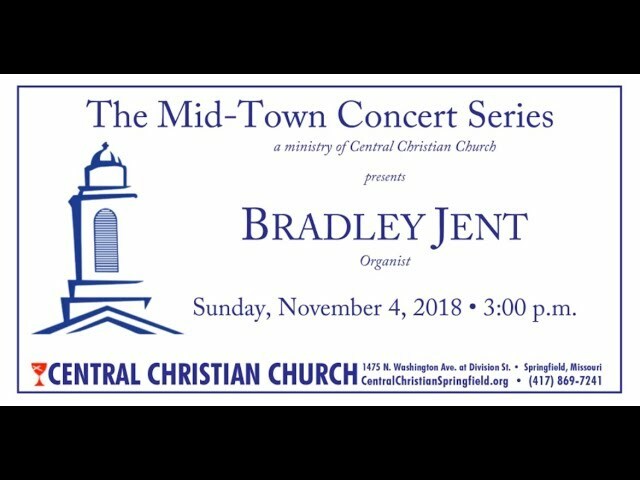 The Mid-Town Concert Series, a ministry of Central Christian Church, will present organist Bradley Jent, in concert on Sunday, November 4, 2018 at 3:00 p.m. with a program titled Praise and Worship with Hymns. Mr. Jent, organist of the Schweitzer United Methodist Church in Springfield, comes to the area from Atlanta, Georgia where he was organist at McEachern Memorial United Methodist Church for the last 20 years. Mr. Jent is known for his improvisation and inspirational hymn accompaniments which will be a prime feature of his concert. The Mid-Town Concert Series, a ministry of Central Christian Church, will present flutist Betsy Nace in concert on Sunday, October 7, 2018 at 3:00 p.m. Mrs. Nace is a native of Springfield, Missouri and alumna of Missouri State University. She was a member of the Springfield Symphony before winning the second flute position in the Buffalo Philharmonic Orchestra, Buffalo, New York serving for 16 years. She is featured on a number of professional recordings including the CD Café featuring The Reeds/Ali Flute & Guitar Duo on their tour performance in Barcelona, Spain. 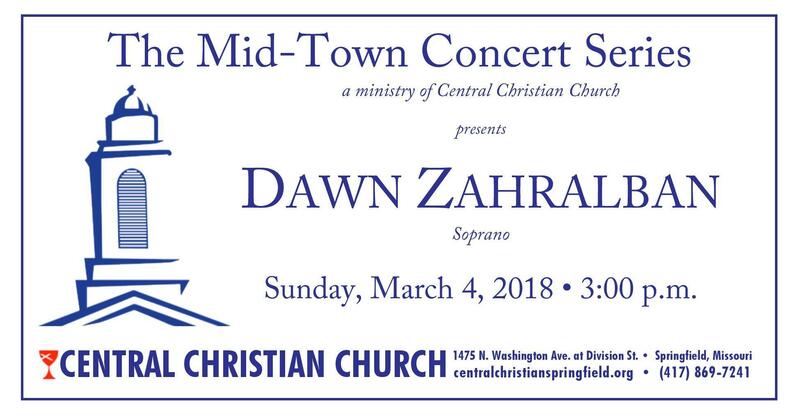 The Mid-Town Concert Series, a ministry of Central Christian Church, will present soprano Dawn Zahralban Gutierrez in concert on Sunday, March 4, 2018 at 3:00 p.m. Ms. Gutierrez is a native of Long Island, New York and received her Bachelor of Science degree in Music Education from the New York University and her Master of Arts degree in Vocal Performance at The Aaron Copland School of Music at Queens College. Currently Ms. Gutierrez is an adjunct faculty member in voice at Evangel University and OTC, as well as choral director at Springfield Catholic High School. 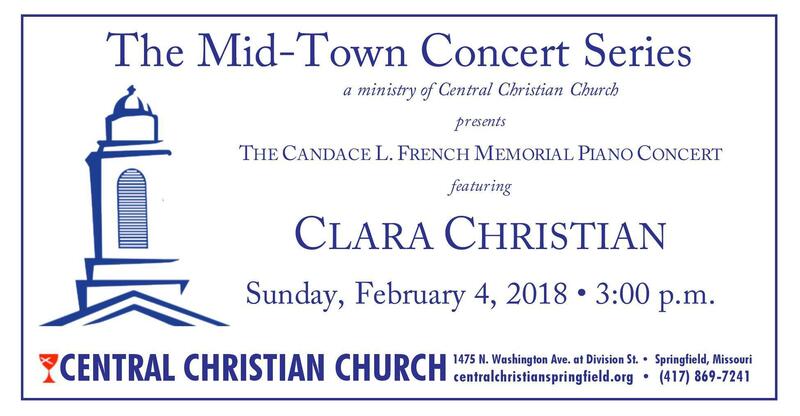 The Mid-Town Concert Series, a ministry of Central Christian Church, will present the third annual Candace L. French Memorial Piano Concert featuring Dr. Clara Christian on Sunday, February 4, 2018 at 3:00 p.m. Dr. Christian, assistant professor of Piano and Music History at the College of the Ozarks, earned the Doctor of Musical Arts degree in Piano Performance and Pedagogy from Northwestern University, a Master of Music degree from the Peabody Institute and a Bachelor of Music degree from Wheaton College. 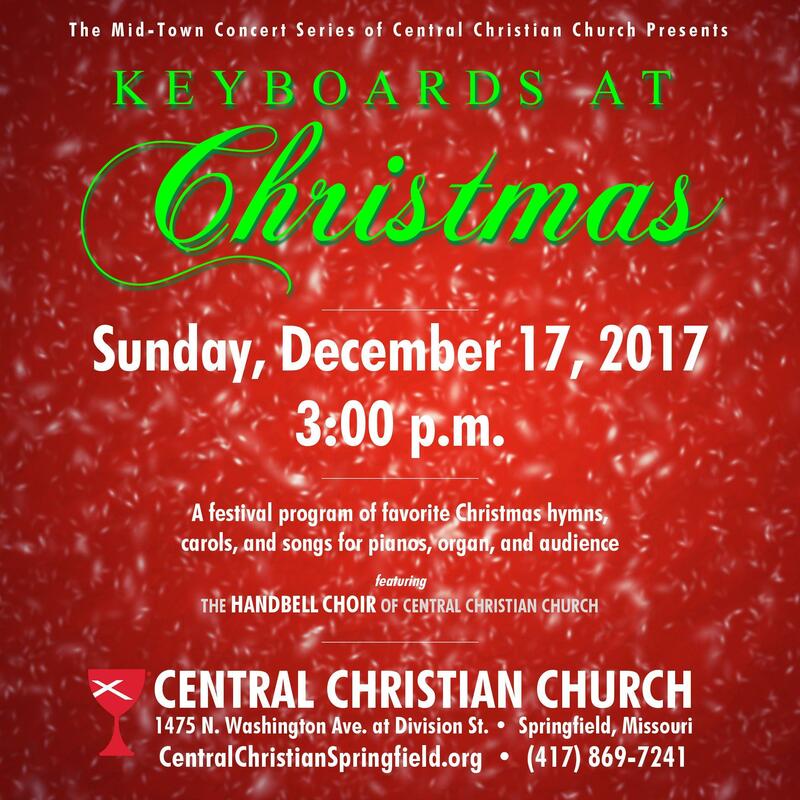 The Mid-Town Concert Series, a ministry of Central Christian Church, will present the third annual Keyboards a Christmas concert on Sunday, December 17, 2017 at 3:00 p.m. This festive concert will feature a wide variety of beloved Christmas hymns and carols using various combinations of two grand pianos and organ and an audience carol sing. An extended prelude featuring the Central Christian Handbell choir will begin at 2:50 p.m. If you would like to hear the concert, below is the audio for Keyboards for Christmas. 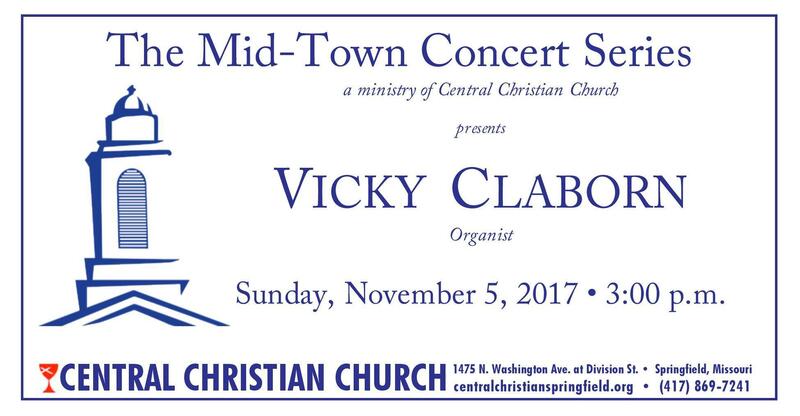 The Mid-Town Concert Series, a ministry of Central Christian Church, will present organist Vicky Claborn in concert on Sunday, November 5, 2017 at 3:00 p.m. in a program titled ‘Tis The Season . . . Almost featuring music for the Advent, Christmas, and Epiphany seasons. Mrs. Claborn, organist of Central Christian Church, earned her Master of Music degree in Organ Performance in 2011 from Missouri State University. In addition to her duties at Central Christian Church she is the accompanist for Logan-Rogersville High School. 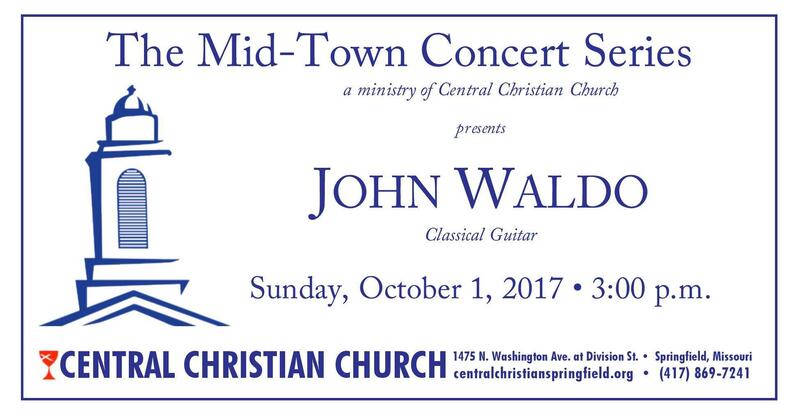 The Mid-Town Concert Series, a ministry of Central Christian Church, will present classical guitarist John Waldo in concert on Sunday, October 1, 2017 at 3:00 p.m. Mr. Waldo has performed as soloist with the Springfield Symphony Orchestra, the Stanton Strings, and the Trinity Recorder Consort of Madison, Wisconsin. Waldo has made multiple appearances on network-affiliated television and has performed live “In the Spotlight” on Wisconsin Public Radio and on the “Studio Live” program on Public Radio of the Ozarks. Mr. Waldo has appeared on multiple occasions in concerts, recitals, weddings, worship services, and social events. 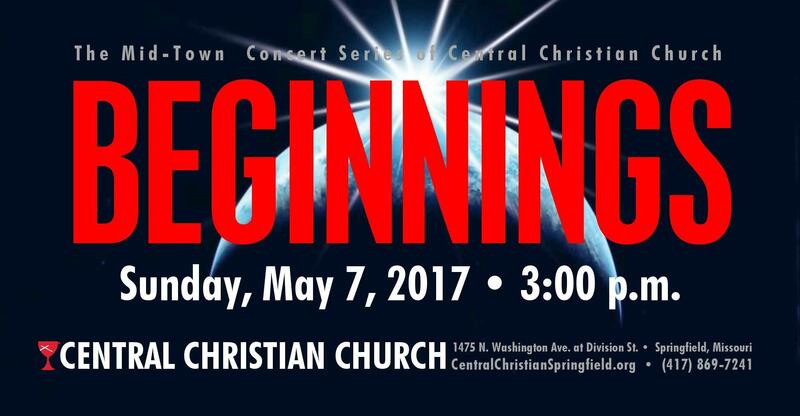 Central Christian Church is located at 1475 N. Washington Avenue at Division Street in the Mid-Town neighborhood of Springfield, just two blocks east of Cox North. Contact the church office by phone at 869-7241, via e-mail at office@CentralChristianSpringfield.org, or browse to the church web site, CentralChristianSpringfield.org for more information. The concert is free. Nace, and Joe McTaggert, organist Vicky Claborn, pianist Pat Pennel, and narrator David Smith. 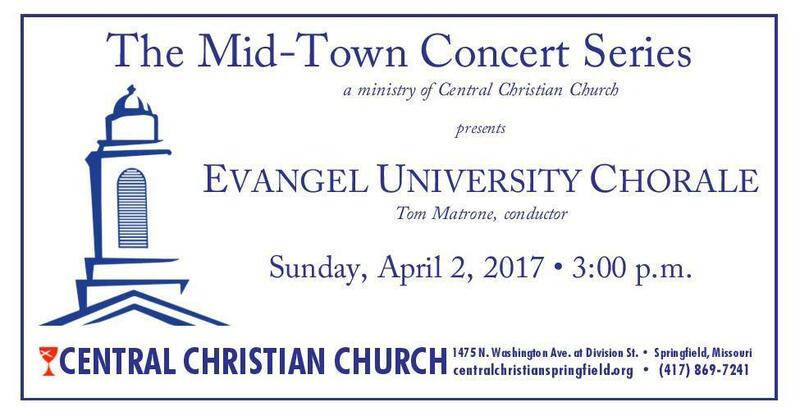 The Mid-Town Concert Series, a ministry of Central Christian Church, will present the Evangel University Chorale in concert on Sunday, April 2, 2017 at 3:00 p.m. The University Chorale is a 45 member select choir which performs both on the Evangel University campus and in the community. The mission of the Chorale is to prepare and present only the best of sacred classical choral literature. In addition to on-campus performances, the Chorale regularly performs with the Springfield Symphony Orchestra. The Chorale completed an international performance tour to Italy in November 2017 including a premier performance in St. Peter’s Basilica in The Vatican. The University Chorale is under the direction of Mr. Tom Matrone, associate professor of music and chair of the music department, and accompanied by Dr. Greg Morris, professor of music. 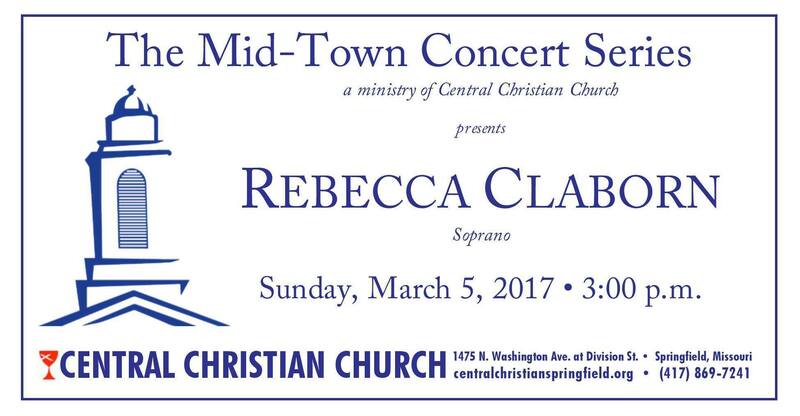 The Mid-Town Concert Series, a ministry of Central Christian Church, will present soprano Rebecca Claborn in concert on Sunday, March 5, 2017 at 3:00 p.m. Ms. Claborn holds degrees in voice performance from the Cincinnati College-Conservatory of Music and Simpson College. She has had the great privilege of performing with multiple opera companies including the Cincinnati Opera, Des Moines Metro Opera, Cedar Rapids Opera Theater, and has completed two seasons with Wolf Trap Opera Company of suburban Washington, D.C. including a cover role of Stonatrilla in the U.S. premier of Florian Gassmann’s L’Opera Seria. While with Wolf Trap she also had the great honor to perform sele...ctions from Sondheim’s A Little Night Music with the National Symphony Orchestra. Ms. Claborn’s concert will feature a wide range of excellent vocal literature representing opera, oratorio, and musical theater genres. Central Christian Church is located at 1475 N. Washington Avenue at Division Street in the Mid-Town neighborhood of Springfield, just two blocks east of Cox North. Contact the church office by phone at 869-7241, via e-mail at office@centralchristianspringfield.org, or brose to the church web site, centralchristianspringfield.org for more information. The concert is free.